One of the perks of being a travel writer is having the local tourism representatives guide you on press trips. You often meet the passionate chefs and owners behind the restaurants and businessess and get a more in-depth education on the city's history and unique vibe. Earlier this month I had the opportunity to spend some time in Tucson on a tour led by Meg Roederer of the Flagstaff Convention & Visitors Bureau and fell in love with this beautiful city. Our group, which included Jaime Daer of the Arizona Office of Tourism. Nicole Pavlovsky of Fresh Chef Nikki in San Francisco, and Stephanie Forrer of Eat, Drink and Travel Y'all in Seattle, met Meg at the Flagstaff Visitor Center. A historic train station built in 1926, the Tudor Revival brick building is located on Route 66 and in addition to tourist information, you'll also find train-themed souvenirs and Route 66 memorabilia. Our first stop for pastries and mimosas was Tourist Home Cafe and Market, a charming spot that was a former boarding house for Basque sheepherders. Serving breakfast and lunch, it offers indoor and outdoor seating on a small front patio and in the back on what was once a Basque handball court. A special treat was meeting Pastry Chef Kat Biemann, who is responsible for the fantastic pies, cookies, cakes, and more that draw loyal fans from near and far. Originally from Germany, this talented Le Cordon Bleu-trained chef has expanded the Tourist Home's bakery repertoire from what was once a simple selection of cake donuts, biscuits, scones and pop tarts to bountiful displays of cookies, brownies, biscotti, pies, cakes, donuts, tarts, and filled pastries baked fresh daily. "I just started testing things out and they would sell, and then it became word-of-mouth. There's a line out the door on weekends." We learn that Friday is Pretzel Bread Day with pretzel loaves, sticks, and rolls for sale. Saturdays is Donut Day when, in addition to regular donut offerings, customers scoop up rotating specials such as German chocolate, banana cream pie, or pumpkin mousse-filled donuts, beignets, and churro donuts. Sticky Bun Sundays commonly sell out of her special cinnamon rolls and sticky buns. Decadent indulges we sampled included chocolate chip cookie dough truffles, peanut butter cup, salted caramel tart, pumpkin spice macarons and pumpkin cheesecake. We also fell in love with donuts, poppy seed rolls, pumpkin spice scones, gluten-free banana oat muffins, cinnamon sugar pop tarts and wonderful airy French crullers (no surprise that these are a best seller!). Tourist Home Cafe and Market is open from 6 am to 8 pm seven days a week, and located at 52 S. San Francisco Street in Flagstaff. You can follow Chef Biemman on Instagram here or via the hashtag #KatTheBaker. Throughout the day on our walking tour, Meg pointed out Flagstaff institutions and local favorites. We also learned about Flagstaff's public art program featuring paintings, sculptures and close to 30 murals in the downtown and southside neighborhoods. You can view a public art map here. This is The Lumberjack Mural or True Blue NAU by "Mural Joe" Cornelius, depicting Northern Arizona University students (called Lumberjacks) and Flagstaff traditions. Piano Room by Sage, Jill and Dan Drllevich and Ricco Distefan on the wall of a former speakeasy. Sound of Flight by Sky Black and Mural Mice (R.E. Wall and Margaret Dewar) that covers a 4,500 square-foot wall of the historic Orpheum Theater. Even Diablo Burger, our lunch stop, featured a mural - Joe Sorren's The Veridic Gardens of Effie Leroux. In the forefront is Mountain Lion #15 of the Promoting Assets With Sculpture (PAWS) project. At Diablo Burger, they strive to use local ingredients as much as possible, including beef from the Diablo Trust ranches outside of Flagstaff which is open-range-raised, grass fed, and free of antibiotics and growth hormones. The menu offers offers 11 specialty burgers served on English muffins such as The Blake with homemade Hatch chile mayo, roasted green chiles and sharp cheddar or the Big Daddy Kane with bacon, cheddar, and db special sauce. This attention to detail results in a superlative burger, juicy and full of beefy flavor. And the fries don't play second fiddle here. The addictive Belgian-style frites are double fried, perfectly seasoned with a dusting of salt and herbs de Provence, and served with your choice of dipping sauce - Hatch chile mayo (my favorite), BBQ, pesto, ranch, chimichurri, db special sauce, or Flagstaff's RisingHy spicy honey mustard. Diablo Burger is open daily from 11 am to 9 pm (10 pm on weekends) and located at 120 N. Leroux Street in Flagstaff. Our next stop was Mother Road Brewing Company, where we had the pleasure of sitting down with owner Michael Marquess over flights of beer. My favorites were the Lost Highway Double Black IPA (their tasting notes: "aroma of orange zest and roasted malts. Hints of bitter orange chocolate balance with notes of dark caramel...") and the El Dorado, with New Zealand hops contributing tropical fruit characteristics such as kumqat and mango. His story began with a heartfelt discussion led by his wife Alissa about a career change that would make him happier, and this former real estate appraiser and home brewer has now found his joyful path. The Marquesses draw the name of their brewery from author John Steinbeck, who coined the phrase Mother Road in reference to Route 66 in his novel Grapes of Wrath. Launched in 2011, this award-winning brewery has become so successful that they are building an 8,000-square-foot production facility that will produce five times the barrels per year currently being sold. "Tower Station IPA is the beer we're known for; we released it two years ago," he explained. "It was the sixth rendition of our first IPA and we knew it was good, but we didn't realize it was going to be the number one IPA in Arizona. It really snuck up on us. It's our best-selling beer and makes up almost 60% of our sales." Congratulations to the Marquesses, who are truly finding the joy in their adventure. We enjoyed a brief respite before dinner as we checked into the Best Western Pony Soldier Inn, a pet-friendly hotel with 75 rooms, an indoor pool, and complimentary wi-fi and breakfast. Our king bedroom suites included a separate bedroom, living room with sofa bed, and two full bathrooms. We were greeted with a gift box from the Flagstaff CVB, and a warm welcome by the friendly hotel staff. Our dining destination that evening was The Cottage, a charming farmhouse French bistro ensconced in a 1909 bungalow. Earlier this year, Executive Chef Scott Heinonen, formerly chef/owner of Tinderbox Kitchen, purchased the Cottage and has made his delicious mark on the menu. At The Cottage, his cuisine is rooted in the regional country dishes of France while incorporating his modern flair and use of locally-sourced ingredients. A housemade charcuterie platter with two types of country pate, pork and cherry rillettes, creamy duck liver pate, salmon rillettes, fennel-crusted smoked sirloin,and house-made pickles. Tartine of cold-smoked salmon with hardboiled egg, capers, tarragon and frisée. Savory pork rillettes on grilled bread with celery-carrot salad and smoked chevre. Sweetbreads with lemon, parsley, capers, marsala, and bacon. Duck two ways with confit leg and smoked breast, paired with honey polenta, sundried balsamic plums, and beurre noisette. Venison paillard with braised red cabbage, fig puree, mustard seed, and balsamic figs. The perfect ending to our day of food and exploration was a gem I immediately fell in love with and another highlight of our trip - FLG Terroir. This wine bar and retail shop is hidden away on the second floor of a building in historic downtown Flagstaff, but is certainly not a secret. A lively crowd filled the space which offered three seating areas, a lounge area in front with large windows overlooking San Francisco Street, seating in the back delineated by a wall lined by wine shelves, and a central bar. Although a small-plate menu offering wine-friendly bites such as appetizers, seafood, and cheese and meat plates is available, we were there for the wine-infused ice cream and sorbet created by Pastry Chef Wamble. Wamble has parlayed her dessert talents into intensely flavorful sorbets, frozen custards, and ice creams that capture the essence of fruit and cordials. "I was working on making reductions and creating flavors at another job at the time," she shared, "so it was a natural progression." At FLG Terroir, you might find specials such as strawberry rhubarb buttermilk sherbert, chocolate and cherry port ice cream, or the golden honeydew sorbet that she made this summer. "One secret is to take all the water out of it and concentrate it. It really gives that punch of flavor that you want." I was enamored of the frozen concoctions we sampled on our visit - a delicate sorbet made with Lillet Blanc (an aromatic apéritif of Sauvignon Blanc and Semillon grapes) and the signature nutty-rich Pedro Ximénez sherry custard. In addition to the dining menu, FLG Terroir offers 30 wines by the glass, a range of craft beers with an emphasis on Belgian Ales, and one of the best retail wine selections in Arizona. It is open at 4 pm Monday through Friday, 2 pm on Saturday and Sunday, and located at 17 N San Francisco St, Flagstaff, AZ 86001; (928) 773-9463. The next morning, we had time for one more Flagstaff meal before heading back to Phoenix. The Toasted Owl is a family-owned cafe with two locations in Flagstaff and serves breakfast and lunch daily with a full bar. The owl theme and eclectic decor is immediately evident, but note the tags attached to furniture and accessories. The owner is a collector of vintage items and everything is for sale. Breakfast is served all day (and lunch until 4 pm on weekends). It's hard to make a decision, with an array of options from shredded pork burritos to chorizo tacos; from prosciutto and brie omelettes to dinner-plate-sized buttermilk pancakes, but my favorite was the vegetarian green chili tamales studded with sweet corn, draped in a spicy salsa verde, and partnered with fried eggs, black beans, guacamole, sour cream, and house salsa. I can't wait to return and see more of what this special mountain town has to offer. 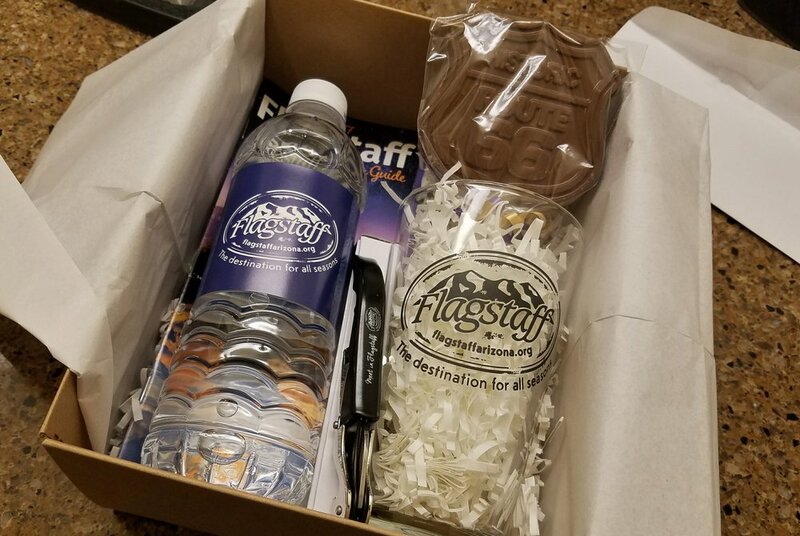 To plan your own Flagstaff trip, find detailed trip information at https://www.flagstaffarizona.org and a calendar of events at http://www.flagstaff365.com.